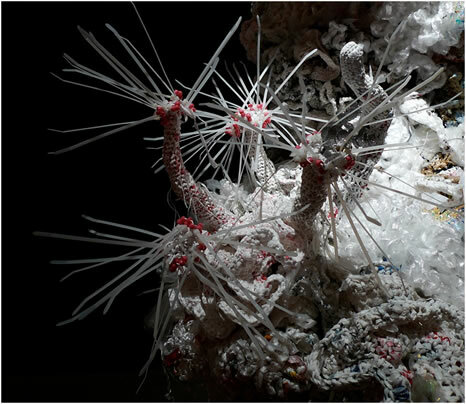 This Saturday, August 3, help construct a giant Silurian sea organism out of discarded plastic rubbish. Come and be part of an evolutionary art-work spearheaded by Science + Art Resident Christine Wertheim. You will learn how to apply the traditional craft of crochet to contemporary cast-offs. All makers will be credited in the resulting work and exhibition. We invite you to bring in your favorite plastic rubbish – particularly discarded airline earphones and headsets. Please Join Us: Saturday, August 3 from 2:00 – 6:00pm @ the IFF. The IFF’s 2013 Science and Art Residency extends the Institute’s interest in hands-on practices inspired by scientific themes by hosting thinker-makers who work at the boundary of the theoretical and material. During summer and fall, our two residents – Christine Wertheim and Jake Dotson – will take over the Institute to use it as a studio laboratory and space for public engagement. This year’s theme, Being Formed, focuses around the question of how form arises in the natural world, a subject that has inspired philosophers and scientists from Aristotle and Kant to Darwin and Einstein. This entry was posted in Aesthetics, Art. Bookmark the permalink.